Everyone wants to drive a nice car but in order to keep it in tip-top condition it’s vital that you take care of your vehicle inside and out. We are all aware of the routine checks, such as oil change, replacing brake pads, belts and hoses, that need to be carried out in order to maintain our motors but there are also some simple ways to ensure your car ages well as you tot up the miles. Avoid exceeding the maximum capacity load for your car. This capacity can be found in your owner’s manual. The greater the weight of your vehicle the harder your car, specifically the brakes and transmission have to work. When you start your car let it warm up in order to give the oil a chance to circulate before you hit the road. Also ensure you check and change your oil and oil filter at the recommended intervals. When your car sustains damage book it into a professional body shop to have it checked over and repaired to avoid long lasting damage. Clean or hire someone to clean the inside and outside of your car thoroughly to ensure its upkeep and resale value when you come to sell your motor. 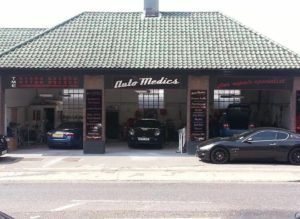 Auto Medics is a professional car body shop in High Wycombe. We can help with the upkeep and maintenance of your car. For body work and repairs get in touch with us on 01494 533 534.